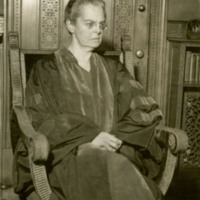 Later portrait of Marion Edwards Park in graduation gown and seated in an armchair. 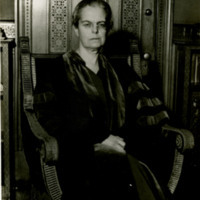 Later portrait of Marion Edwards Park seated in an armchair. Portrait is bound in a blue cover. Inscribed below the portrait: "For my friends: Lelia and Frank Stoker from Marion Park. 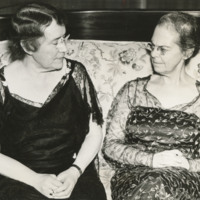 May 1943." 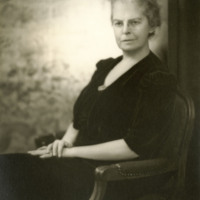 Later portrait of Marion Edwards Park seated in an armchair. 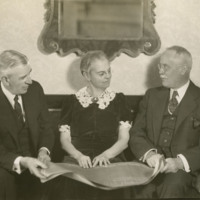 Photo of Marion Edwards Park seated between two gentlemen. Inscribed on the back "Mr. Livingston-Narberth, PA."
Later portrait of Marion Edwards Park in graduation gown. 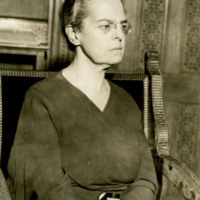 She is seated in an armchair.